Dublin is ranked as the 26th best city in the world for quality of life according to one survey. However, the top ten ranked cities are all mid-sized cities like Dublin. To make it into the top of the list, Dublin has to become a city that is healthy to live in and easy to get around … for everyone. That means developing a transport network that is affordable, easy to use and helps people go wherever they need to go. It also means neighbourhoods that are safe and attractive for cyclists, pedestrians and local communities. Recent capital expenditure cut-backs are forcing a rethink of our approach to transport and infrastructural solutions. But lessons from other places suggest that the best cities are not necessarily ones that spend the most money, but make the smartest choices. 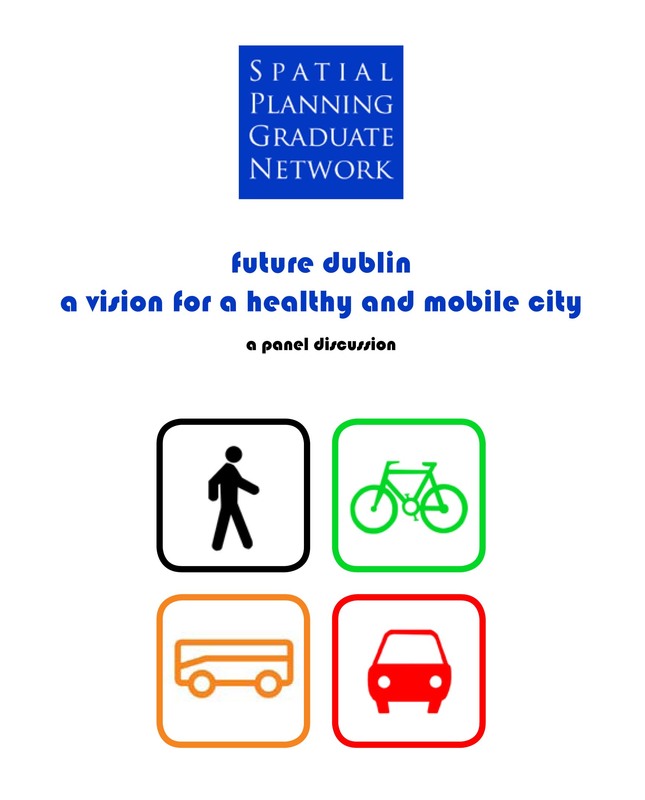 Future Dublin is about imagining what kind of transport network that might be and what those streets and spaces might look and feel like. It is a vision for a healthy and mobile city. 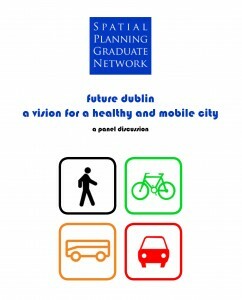 On the afternoon of Friday, 2nd March 2012 at The Mansion House, Dublin, the Spatial Planning Graduate Network will hold its third Planners Forum, a panel discussion on the subject of ‘Future Dublin: A Vision for a Healthy and Mobile City’. Confirmed speakers include Lord Mayor of Dublin, Andrew Montague, Brendan Finn (ETTS) and John O’Hara (Dublin City Council Deputy City Planner). The programme for the event is available for download here. Places are limited and will be awarded on a strictly first-come, first-served basis. Please RSVP with your name and the names of the guests you wish to bring to events@spatialplanning.ie by Tuesday, 28th February 2012. This entry was posted in Uncategorized on February 16, 2012 by Amy Hastings. 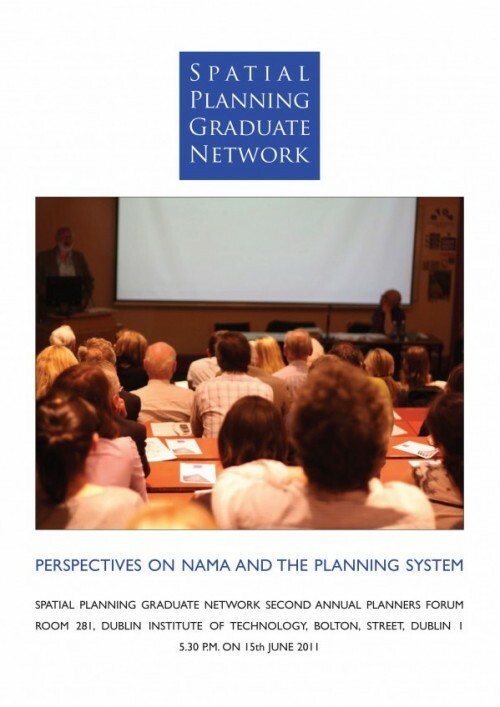 The Report of the second annual Spatial Planning Graduate Network Forum on ‘Perspectives on NAMA and the Planning System’ is available for download here. This entry was posted in Uncategorized on December 23, 2011 by Amy Hastings. The Spatial Planning Graduate Network held its second annual Plannera��s Forum on the topic of a�?Perspectives on NAMA and the Planning Systema�� at the Dublin Institute of Technology, Bolton Street on the evening of Wednesday, 15th June 2011. Four panelists, Joan Burton TD (Minister for Social Protection), Michael Wall BL, (Barrister-at-Law), Conor Norton (Government Advisory Group on Unfinished Residential Development) and Conor Skehan (Lecturer, DIT School of Spatial Planning) were invited to speak and to take part in an informal discussion and debate with the Spatial Planning Graduate Network and invited guests. David Oa��Connor, Chairperson of the SPGN, opened the Forum by speaking about the key issue in any debate about planning and the National Asset Management Agency: can it be possible for NAMA to achieve the highest economic return on lands within their control while, at the same time, ensuring the long-term sustainable development of Ireland?A� NAMA and concerns surrounding its operation seem to be generally accepted as economic concerns, but ignoring the spatial element could be short-sighted.A� There are many examples of asset disposal and spatial planning working together (e.g., Shrinking Cities projects in East Germany) and, where spatial planning is a consideration, those cities are recovering fastest. Joan Burton, TD, was unfortunately unable attend the Forum due to her DA?il commitments so Michael Wall was the first of the panellists to speak. Michael Wall BL is a former member of the board of An Bord PleanA?la, who was appointed by the Minister for Finance as a member of the NAMA Planning Advisory Committee in April 2010.A� Speaking in a personal capacity, Michael noted that, contrary to first impressions that planning plays a minor part in the NAMA legislation, when scrutinised, spatial planning would seem to play a larger part than first imagined.A� In particular, Michael made reference to what might be considered extensive planning powers set out in five key provisions (sections 2, 10, 11, 12 and 33) of the 2009 Act. Conor Norton, Director of Loci and Appointee to the Government Advisory Group on Unfinished Residential Development, stated his opinion that the NAMA legislation is designed to address a financial threat to the State and to the banking sector.A� As such, the 2009 Act has little or nothing to do with spatial planning and is an inappropriate mechanism for confronting long term goals associated with the social and economic development of Ireland.A� In order to realise important national, regional and local level strategic goals, it may, therefore, be necessary to transfer the wider goals of NAMA to a Strategic Development Corporation. Conor Skehan, Director of CAAS Environmental Services Ltd and Lecturer at the DIT School of Spatial Planning, spoke in highly critical terms on the subject of NAMA, describing the legislation as destructive of our assets and our entrepreneurship.A� Rather than planning for prosperity and then seeking to provide the property to accommodate it, NAMA seeks to somehow achieve economic return from land and leaves the formulation of a strategy for prosperity until later.A� The circumstances that led to the establishment of NAMA are a symptom and not the cause a�� the cause is poor planning that is rooted in an obsession with housing and settlement. Following the conclusions and presentations from the panellists, the floor was opened up to debate.A� Topics raised included the potential for temporary use of NAMA lands as community gardens; the particularly difficulties associated with the conservation of NAMA-owned heritage buildings; the benefits of dealing with NAMA over abandoned unfinished developments with untraceable owners; remaining excesses of zoned land; and the need for an expert regional-level planning body. The event was followed by a reception, which was generously sponsored by CAAS Environmental Services Limited. Amy Hastings BCL, BL, MSc (Spatial Planning), MIPI works as a planning consultant in private practice, is a partner in ARC Consultants and Secretary of the Spatial Planning Graduate Network. This entry was posted in Uncategorized on July 11, 2011 by Amy Hastings. Can a�?Putting People Firsta�? change the face of Local Government (and Planning) in Ireland?